Padua has been defined as "Capital of painting of the fourteenth century" by the art critic Vittorio Sgarbi, pictorial testimonies of the fourteenth century - among them, Giotto cycle to Scrovegni Chapel - make it a crucial node in the development of Western art. Artistic splendor of the fourteenth century was one of the fruits of the great cultural fervor favored by the lordship of Carraresi, who made Padua one of the main centers of prehumanism. In Padua, between the fourteenth century and the fifteenth century, an imposing cultural current devoted to the ancient that developed into the so-called "Paduan Renaissance" developed in conjunction with Florence. Home to a prestigious university, one of the oldest in the world (1222), Padua is universally known as "City of Saint", a name used to call Sant'Antonio, famous Portuguese Franciscan who lived in the city for a few years, remains are preserved in Basilica of St. Anthony, an important pilgrimage destination of Christianity and one of the main monuments of the city. 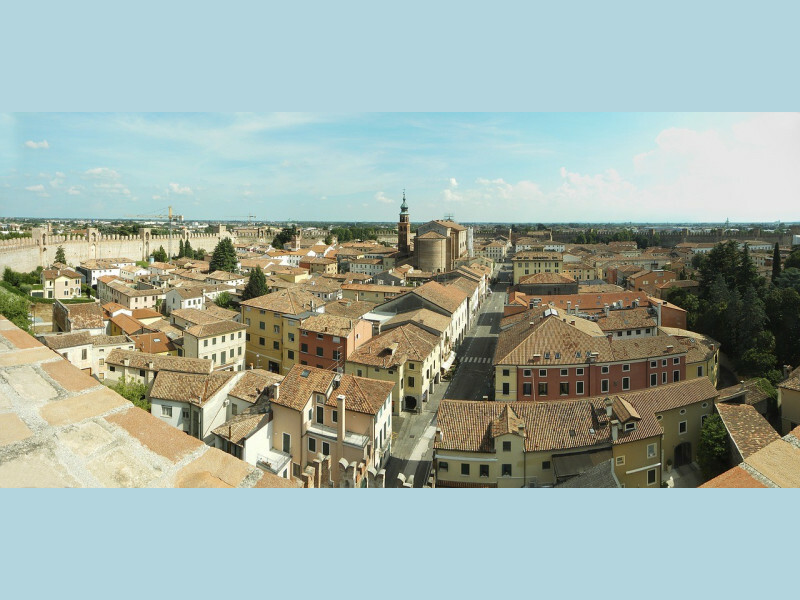 Taming of the Shrew, a comedy by William Shakespeare, is set in Padua. Among the green spaces stands Botanical Garden, UNESCO World Heritage Site, and Treves de Bonfili Park, designed by Giuseppe Jappelli. Legend has it that the foundation of Padua took place in 1132 B.C. by Antenore, a Trojan prince survived the destruction of Troy, but it is known that such a legend perhaps derives from a false historical. Monumental structure of the urban context testifies to the various phases of the city's history: starting from Roman Arena, passing through various city walls, Medieval towers, palaces of stately age, churches and other places of worship, symbolic buildings of civil power, up to expressions of avant-garde architecture. Among the main destinations of religious tourism in the world, Basilica of Santa Giustina is a container of distinguished relics. Romanesque buildings of Santa Sofia, San Nicolò and Baptistery, Gothic churches of Eremitani, of Santa Maria dei Servi, of San Francesco Grande, Basilica del Carmine, Sanctuary of San Leopoldo and Synagogue of Padua, in the central area of Ghetto, testify to spiritual activity of the city. Among the palaces, Municipal one, city hall, Palazzo del Bo, Loggia dei Carraresi, Caffè Pedrocchi, historic "café without doors" and Palazzo del Monte di Pietà, in Piazza del Duomo. One of the reasons for the pride of Paduan people are the porticos that, scattered everywhere in the city center for a total development of about 12 km, make Padua the second city in the world, after Bologna, for the longest roads. Prato della Valle is instead recognized as the largest square in Europe. Civic Museums include a very rich circuit, which includes: Complex of the Eremitani, Multimedia Hall of Scrovegni Chapel, Archaeological Museum, Museum of Medieval and Modern Art. Paduan theaters are scattered throughout the city, among the main ones, Teatro Verdi, Gran Teatro Geox and Teatro del Seminario Vescovile (recently restored). Padua is also known for being the "City of Without": "Santo without name", Sant'Antonio; "Café without doors" and "Prato without grass". Not many, however, to know the story of the "two cats", which are also among the most curious icons of the city: the cat of Sant'Andrea, a statue located on a column in the small churchyard in front of the relative church; and Bastione della Gatta, near Giardini della Rotonda. Canton del Gallo, however, is traditionally considered the most central point of the city. Gastronomic tradition of Padua is very long, among typical dishes, Bigoli, together with Risotto, are the most famous first dish of Paduan area; Padovana, typical breed of chicken known all over the world since 1600, characterized by famous tuft; polenta, Veneto Berico-Euganeo PDO Prosciutto, "Pazientina" cake and now famous Spritz, which was invented here in its popular form. Among the events: Padova Vintage Festival (September), "Sant'Antonio Marathon" (April) and Festa di Sant'Antonio (June 13th).